This is a great game for guests to play while they are waiting for the reception to start. Place pieces of paper at every table and put a beginning sentence at the top of the paper; for instance, "Susie and John are married now ... " Have the guests finish the phrase in a rhyming way. Guests can share their poems or can keep them to themselves, but be sure that everyone gives them to you before they leave so you can have the memories. This game is a traditional wedding reception game and can be played with any number of people. Give guests a dollar, turn the music on, and begin passing the buck from guest to guest. Whoever is left holding the dollar when the music goes off wins the money. It's similar to hot potato, and who wouldn't enjoy the possibility of winning money? Guessing is a great way to incorporate decor and fun into your reception. Fill jars, glasses or vases with pebbles, gumballs or stones that are the same as your wedding colors. Set up a couple of pieces of paper next to it and have guests take a guess at how many are in there. Award cute prizes to the closest guessers. 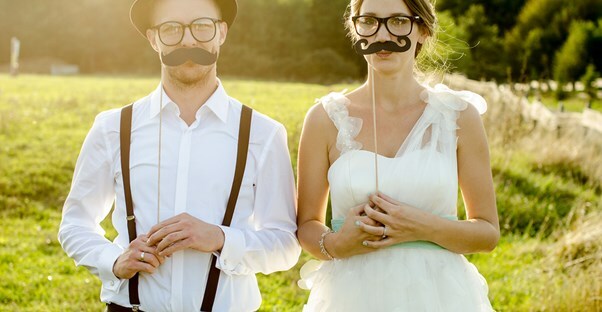 This game focuses on the bride and groom and is a great way to get the crowd roaring with laughter. The couple sits back-to-back and trades one of each of their shoes with each other. They are then asked questions such as, "Who is better at cooking?" at which point they will hold up the shoe of the person they believe is better at cooking. They can't see each other, which can lead to some hysterical reactions. Purchase a wedding-themed version of this popular game and leave a few sheets from the tablet at each table for guests to complete. You can also make your own or use a generator that will allow you to tailor it specifically to your wedding. Be sure to have guests read them out loud for some serious laughs.